For Stanley Bagg to make a note of that visit, it must have been a special day indeed. "Mrs. Mitcheson" was Stanley’s son’s mother-in-law, Fanny Mitcheson, from Philadelphia. She had probably come to Montreal to be present at the birth of another grandchild, Catherine Sophia Bagg, born a month later. Stanley wrote nothing more about this visit, but I like to imagine what might have taken place. He had been a widower since his wife’s death 15 years earlier, but he probably he had a servant to clean and cook for the occasion. In addition, son Stanley Clark Bagg and daughter-in-law Catharine Mitcheson Bagg lived nearby, so they probably helped with the arrangements. Perhaps he and his visitor discussed the weather, or the recent birth of Queen Victoria’s seventh child. Fanny was an American by choice (born Mary Frances MacGregor, she had immigrated to the United States from Scotland as a young woman) and Stanley was an American by birth (born in Massachusetts, he came to Canada as a child,) so maybe they talked about the recent California Gold Rush. Stanley’s son and daughter-in-law probably attended this gathering. Another possible guest was Mary (Mitcheson) Clark, Stanley’s deceased wife’s mother. She also lived nearby, in a house called Clark Cottage. Mary, a widow, would have been age 74 at the time. Mary Clark and Fanny Mitcheson were also related by marriage: Mary’s brother was Fanny’s husband, Robert Mitcheson. I do not know whether Robert accompanied his wife to Durham House, or even if he came to Montreal. If he didn’t, someone else must have travelled with her. She certainly would not have come from Philadelphia to Montreal by herself. Long-distance travel in 19th-century North America was time-consuming, complicated and uncomfortable. Thankfully, transportation was improving, especially after the first North American railroad started operating in 1826. Perhaps Stanley saw fit to note Fanny’s 1850 visit because he realized what an effort she had made to get there from Philadelphia. 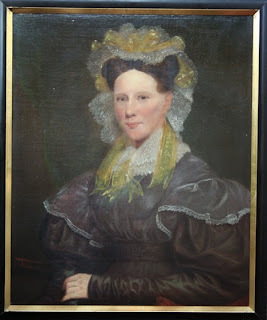 Mary Mitcheson (1776-1856) and her brother Robert Mitcheson (1779-1859) were born in County Durham, in northeast England, and immigrated separately to North America. Mary, her husband John Clark (1767-1827) and daughter Mary Ann (1795-1835), settled in Montreal around 1795. Mary Ann married Stanley Bagg (1788-1853) in Montreal in 1819. Robert Mitcheson arrived in the United States from Antigua in 1817. I do not know when or where he married Fanny MacGregor (c. 1792-1862). They lived in what was then the outskirts of Philadelphia. All these relationships boiled down to one central fact: Stanley Clark Bagg (1820-1873) married his first cousin once-removed, Catharine Mitcheson (1821-1914). They were wed at Grace Church, Philadelphia on Sept 9, 1844 by Reverend Robert Mitcheson, the bride’s brother. If the family was upset about the blood relationship between them, no hint of that has survived. 2 An inventory of the contents of Durham House is included in Act No. 3556, dated 2 Nov, 1842, of notary Joseph-Hilarion Jobin, accessed at the Bibliothèque et Archives nationales du Québec (BAnQ) in Montreal.